2019/03/11 For Drive Eraser Users: MediaClone developed a new feature allows erasing Netapp/EMC drive and complies with the NIST 800-88 Erase protocols. 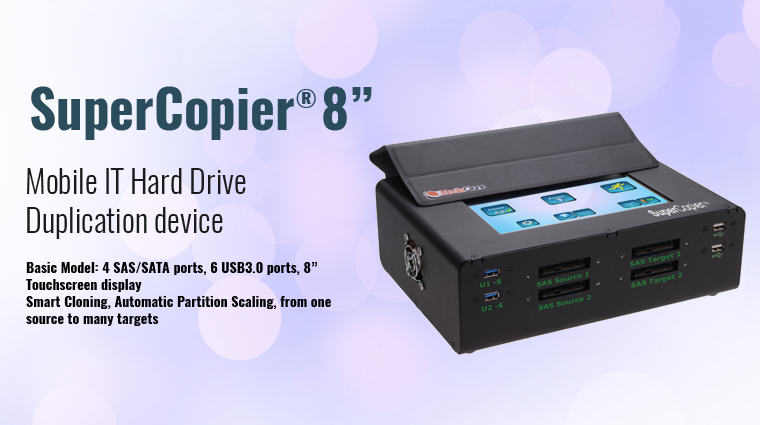 2018/04/27 MediaClone just released the SuperCopier and SuperWiper XL units with great dependability to support External Storage. 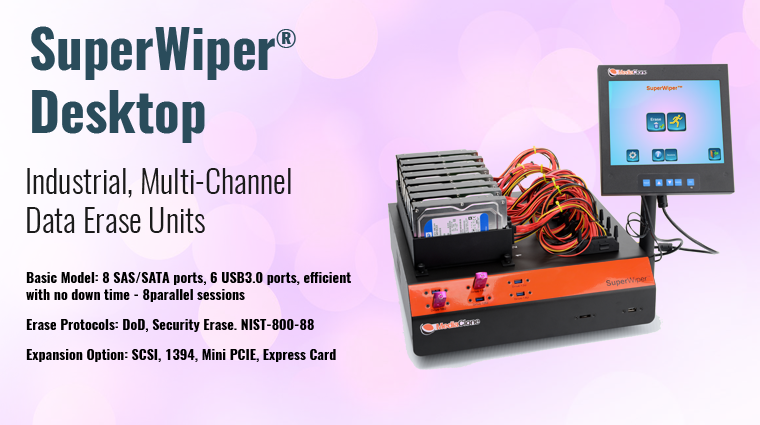 2017/04/24 MediaClone proud to announce the release of 2 new products: SuperWiper Desktop XL that can simultaneously erase data from servers and enclosures up to 31 storage devices, and the SuperWiper SCSI 2 ports 4 drives that user can erase 4 SCSI drive in 4 separate sessions. It is an important feature when companies moving from Hard disk drives to SSD and need to shrink down images. 2017/02/01 MediaClone proud to announce the release of new s/w that supports a true NTFS scale down for IT using Quick Copy. It is an important feature when companies moving from Hard disk drives to SSD and need to shrink down images. 2016/06/05 MediaClone in Techno Security booth # 206, Myrtle Beach, SC. 2016/05/24 MediaClone in Enfuse Las-Vegas in Sumuri Booth. 2016/04/19 MediaClone in ICAC Atlanta. 2016/03/09 MediaClone in Forense 2016 Mexico City, March 7-9 booth 501 with Tamce Corp.
2016/02/06 MediaClone released a new Mobile M.2 Complete KIT. The KIT includes many SATA and USB3.0 adapters that enable the user to capture, clone and erase from different kinds and types of M.2 SSD (It supporting PCIE and SATA protocols). 2016/02/23 MediaClone are exhibiting in CIFI Singapore with Nexia-TS. 2015/11/23 A second year in a raw, MediaClone are exhibiting in the Netherlands Cyber Security conference Nov 23-24 in Arnhem. 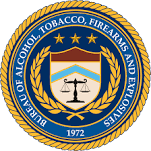 2015/08/31 Please visit us at HTCIA conference Orlando, Florida Aug 31 @ boot #306 to see some of the SuperImager Plus Forensic New features. 2015/07/12 Please visit us at PFIC Huntsville Alabama Jul 14-15 to see new features of SuperImager Plus. 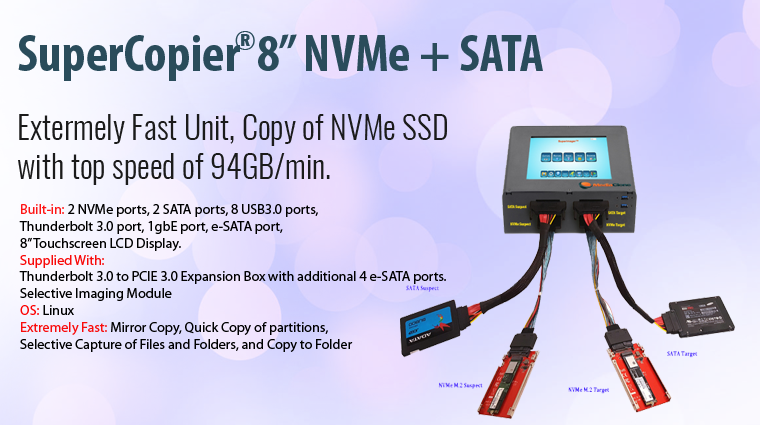 2015/06/06 New Product Release: 3 Types of M.2 NGFF to SATA adapters are available: M.2 NGFF supports SATA Protocols, M.2 NGFF supports PCIE protocols for MacBook Air 2012, M.2 NGFF supports PCIE protocols for MacBook Pro 2012. 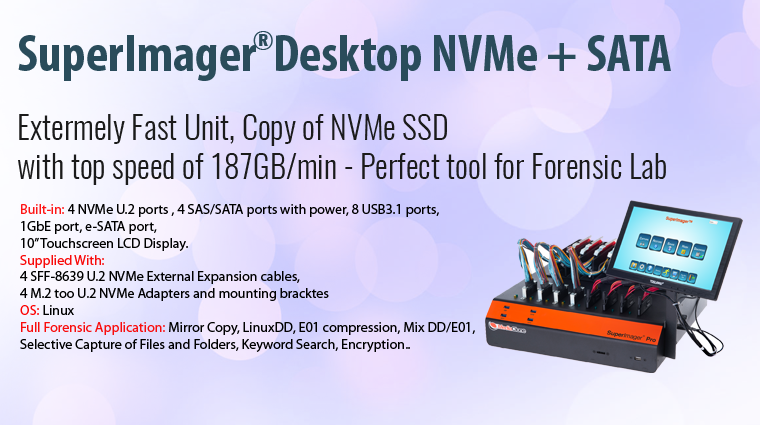 2015/06/01 Please visit us in Techno Security conference in Myrtle Beach SC booth 407 and see the first Linux Forensic Imaging units with dual boot option; Linux Imaging and Windows Analysis.Extremely Fast unit when running E01 with full Compression, and Easy to Use with Multiple Sessions Navigation screen. 2015/05/18 CEIC2015 in Cesar Palace, Las Vegas, booth 111. 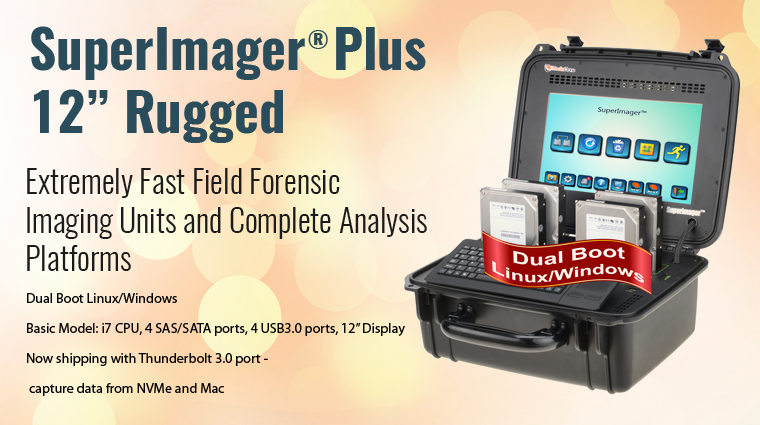 2015/05/14 New Major release of SuperImager® Plus - The New Generation of Linux/Windows Dual-Boot Units – Mobile Forensic Field Imaging and Complete Mobile Forensic investigation platforms, running on Linux OS, with a dual boot option. Run Forensic Imaging on Linux, run third-party applications on Windows.The Linux application enhanced speed, utilizing multiple threads engines, especially with E01 format with full compression. 2015/04/14 Interpol Security Conference in Singapore. MediaClone share a booth with Nexia-TS. 2015/03/17 New Product Release: External USB3.0 to SATA 4 Channel Kit - Convert 4 USB3.0 ports to SATA ports with the use of one external power supply to power the 4 drive's caddies and the 4 hard disk drives. Can be used with many units. 2015/03/15 New Product Release: External Battery Kit for 7" Mini Unit - 10AH Rugged Lithium-Polymer can last 2h or more when use to performs forensic imaging of 1:2 1TB hard disk drives, or 5-6h when used with USB and flash Media storage devices. 2015/02/21 Please visit us in booth 312 Mexico City WTC in first forensic conference in Mexico (www.expoforense.com Feb 24-26). 2015/01/29 SuperWiper 8" SAS erase units, are been used today by small IT corporation, especially when versatility and mobility is needed. 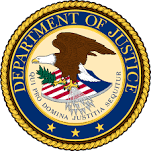 2015/01/29 SuperWiper desktop units, are been used by US gov, large corporation, and also by IT companies that contracted to erase large amount of drives. In one case, the SuperWiper unit was used nonstop 24/7 without ever powering the unit off even for a second! 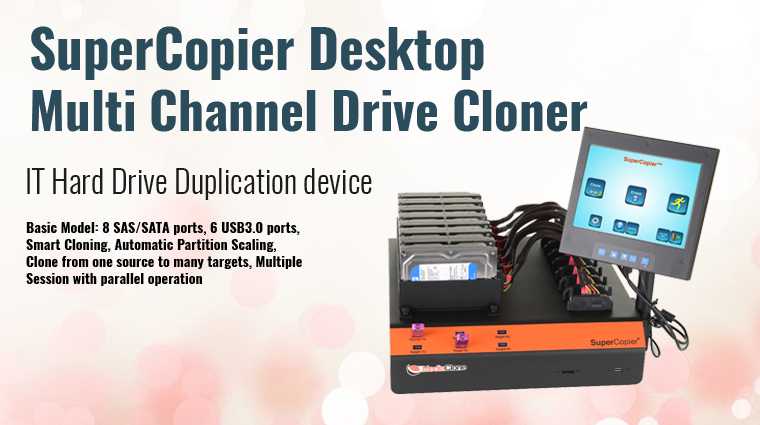 2015/01/11 New Product Release: SuperCopier Desktop industrial unit, complete clone and erase unit form multiple storage devices, easy to use, Linux base. 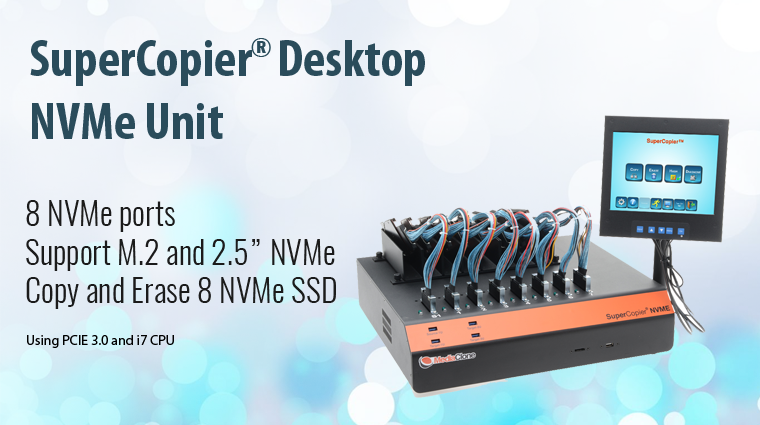 2015/01/11 New Product Release: SuperCopier 7" Field unit, a perfect tool for IT tech: Economic, Compact, Fast, easy to use, Linux base. 2015/01/10 Please visit MediaClone booth 2611 in Legal Tech NY 2015 Feb 3-5. 2014/11/12 PFIC Conference in Snowbird, UTAH. 2014/11/05 CyberCrime conference in the Netherlands that included a workshop with hands-on SuperImager units was very successful. 2014/10/11 MediaClone Releases SuperWiper 7" Field Data Erase Unit. Low Cost, Extremely Fast, Very Compact, and Easy-to-Use data wiper unit that can run data erase on seven storage devices simultaneously. "3/27/2018 "Media Clone - We’ve been using our MediaClone SuperCopier for over a year now in a very intensive industrial process. Its unique connection harness made it the best fit for needs – no need to strip drives out of caddies. During that time we’ve run probably over 1000 drives through it with little or no fanfare. It does what we need without fuss. Not consumer level by any means but rather a rugged, reliable, get the job done product. We recently had some issues, were ready to repair it ourselves, but Media Clone wanted to make sure everything was up to snuff and took it in-house to fix themselves. They were extremely courteous, repairs were extremely fast, costs were very minimal and as soon as we get it back we’ll be back in business. The old ways of cloning drives one at a time are just too tedious for words. We highly recommend Media Clone and their products. Hugh Reynolds SFMTA Video Shop"
11/22/2016 "First America Metal Corp purchased a Media Clone 8 hard drive wipe machine based on a-Scrap demo we saw at the 2016 E-Scrap show. The machine has lived up to expectations and the service provided by Ezra in learning to use and troubleshoot the equipment has been fantastic.. Recommended...". Les Bury President First America Metal Corp"
2016/02/03 “We have searched for few solutions that could help us to destroy our data from retired storage and came across MediaClone SuperWiper solution. I must say, it saved us lots of time erasing individual disks so we have decided to add the Disk Duplicator solution to clone drives. IT Folks love to be able erase data with DoD formatting tool and also provide audit trail for our auditors. Great product and I would highly recommend it.” Les Janeczko Manager, IT Infrastructure Fuzion Analytics. 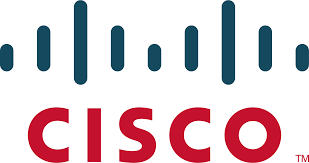 2015/12/14 A Quote from Warren Smite, Prosoftnet, Calabasas, CA: "For our purposes, being able to sanitize many drives swiftly is a serious need. We looked into several devices but they were usually made for single purposes that didn't match what we were looking for.The MediaClone SuperCopier has allowed us to speed up cleansing drives dramatically as well as clone drives. It's flexible and allows for many operations simultaneously. In the rare event of any issues, we have always received prompt support from MediaClone. The SuperCopier is very well constructed, simple to use, and reliable". 2014/11/01 A quote from Suwandi Chandra: "MediaClone is a great tool to have. It delivers speed unmatched by other products in its class". 2015/01/29 A quote from Berry Huijps: "The SuperImager 12" Rugged Forensic unit is a perfect way to combine in field acquisition and a in lab solution! We use the device all the time to performs Forensic Imaging, Cellphone extraction, and Forensic Analysis . It is very fast and easy to use". 2015/02/28 Quote from Joe Katz who use extensively the SuperWiper Desktop unit for quite some time: "I love your product. I am working on a 4,000 unit drive project and using your product and 2 14 bay Kanguru drive duplicators with DOD data wipe capabilities. The project requires a DOD wipe and drive re-image. The MediaClone device is far superior. Kanguru units take 4 times longer and are not close to the MediaClone SuperWiper build quality. MediaClone is fast, reliable, and built like a tank". 2015/08/16 A quote from Benny Potlog Intel Israel: "The MediaClone SuperCopier Desktop unit works very well. The unit runs very fast in multiple session operations, and it is very easy to use. We have loaded many different kinds of partitions on the source drive, and the Quick Copy mode works very well cloning the source to many targets. The application supports GPT and MBR partitions with scaling and non-scaling, NTFS re-size works with different size targets, and the latest Windows 10 is very well supported". 2015/08/28 A quote from Jenny Parr, Tesla Helpdesk/Network Services, IT Operations: "I changed the setting on the SuperWiper Desktop application per Ezra recommendation to Security Erase which is making it run a whole lot faster; 2 hours – woohoo!!!". 2015/10/01 A Quote from Massimiliano Graziani CFE CIFI ACE CFIP OPSA "In our Digital Forensics Lab we had everything, but lacked something versatile and multi-role, so we decided to buy a MediaClone SuperImager Field unit. I'm very pleased; it's fast, secure and versatile!". 2015/11/08 A Quote from Steve W NZ: "We have been using the SuperWiper Desktop for quite some time and are very impressed. It helps us significantly to speed up the erase drive process, erase verification process and saves us a lot of time and money. 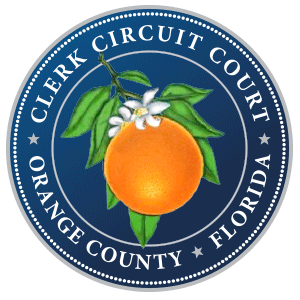 The application is very robust and easy to use. The unit preforms at a very high speed and has many built-in great features. The Tech support is superb and they are really listening to what we need. They have customized the application for us twice, each time in less than 24h! They really know what they are doing! ".